Itay Lahat is a veteran viticulturist and winemaker, who graduated in Horticulture from the Hebrew University of Jerusalem and in Viticulture and Oenology from Adelaide University in South Australia. This is in addition to the MBA he received from the Hebrew University. 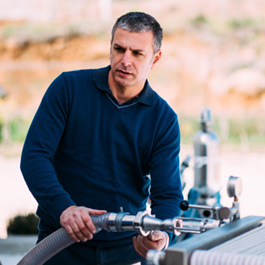 He has been described as the Michel Rolland of Israeli wine and his services are in great demand as a winemaking and viticulture consultant to some of Israel's leading wineries. Lahat is the professional coordinator of the wine activities at Tel Hai Academic College, where he founded the service laboratory for the college wineries. He is the academic director of the annual wine trade conference of the Israeli wine industry and lectures at the Department of Biotechnology and Food Science at Tel Hai College, the Department of Tourism and Hotel Management at Ben-Gurion University and the Second Degree Winemaking Program at the Hebrew University. Itay believes that Israel can excel and become known in creating a unique wine style based on a blend of Rhone Valley varieties. “The wines should be rich and complex, yet soft and balanced and pleasant to drink as soon as they are released. They should also have the capacity for aging." This philosophy is expressed in the Itay Lahat’s handcrafted wines: Lahat Lavan and Lahat Adom. Kim Marcus, the editor of Wine Spectator, interviewed and wrote about Itay Lahat in the October 2016 Magazine Special about Israeli wines. Jancis Robinson OBE, MW, included Lahat wines in her 2017 Israel visit summary in both the Financial Times, and her website. Adam Montefiore wrote about Lahat's complete portfolio in February, 2018. Both Lahat white and Red are mentioned in Hugh Johnson's 2019 guide.